Fabulous wrap dress by Makie. Hooded sweater dresses by BonTon. Both are size 18 mo. 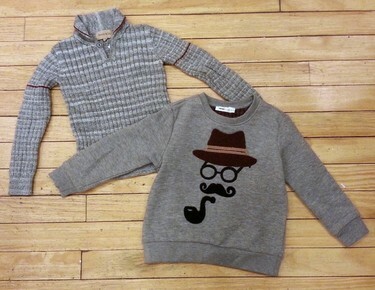 Super stylish fleece sweater by Dou Dou. Darker grey corduroy pants, size 18mo. Light grey corduroy pants, size 12mo. Wonderful snowsuit by Petit Bateau. Ultra hip, lined, faux leather jacket by Koton Kids. New with tags button down shirts! New with tags shirts by Koton Kids! Bottom cat shirt, size 3-4.